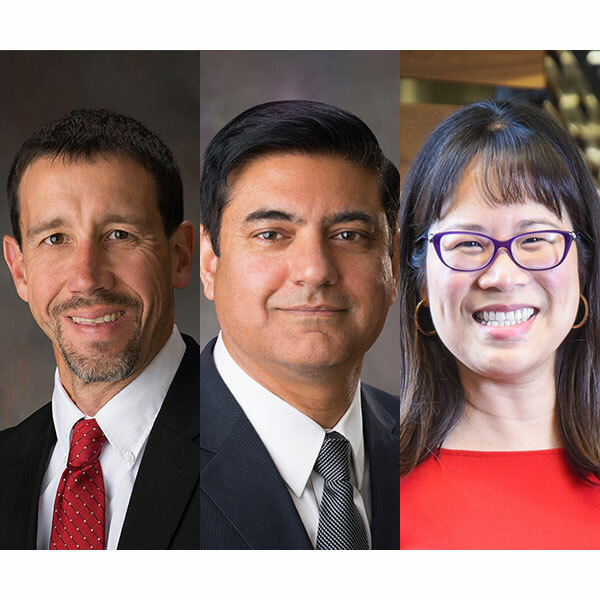 Three faculty – (from left) Daniel Linzell, Aemal Khattak and Lily Wang – have accepted new roles in the College of Engineering’s leadership team. Changes in the College of Engineering leadership team have brought new roles for three faculty – Daniel Linzell, Lily Wang and Aemal Khattak. Linzell has joined the College of Engineering leadership team as associate dean for graduate and international programs, effective Oct. 1. For the previous five years, Linzell had been chair of the Department of Civil Engineering in addition to his role as Voelte-Keegan Professor of Civil Engineering. Khattak, professor of civil engineering, has been appointed interim department chair. Wang has transitioned into a new role as associate dean for faculty and inclusion, after having been associate dean for graduate programs and faculty development. Wang is also professor of architectural engineering in The Durham School of Architectural Engineering and Construction.